Which one should you stay in? 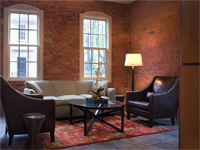 Choosing between Newport Rhode Island hotels, bed and breakfasts and vacation rentals can be tough. Which of these scenarios sounds better to you? Would you like to wake up to the smell of the ocean and an amazing waterfront view? Would you like to be in the middle of all the action, right in the heart of historic downtown Newport? Or would you like to have a little more privacy and tranquility in a secluded private beach cottage? Whether you desire contemporary or historic hotels, downtown, harbor or oceanfront views or the privacy of your own beach cottage, Newport hotels offer whatever you're looking for. 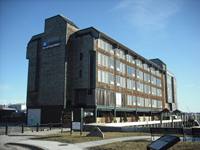 Newport RI hotels are all blessed with the same prime feature: location, location, location! Wherever you decide to stay in Newport, you'll be within walking distance of the majority of our fabulous restaurants, lively bars, never-ending shops and fascinating attractions. 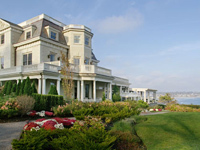 There are so many great Newport Rhode Island hotels to choose from. Discover your perfect vacation accommodations by visiting the links below. The former summer home of Harvard marine biologist Alexander Agassiz. 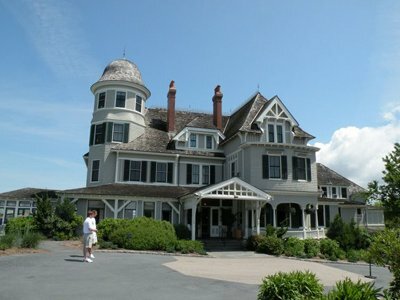 Castle Hill Inn & Resort is now a restaurant, hotel and popular location to hold special events and weddings. One of the best oceanfront hotels in Newport RI. Of all the great Newport Rhode Island hotels, only the Chanler is fortunate enough to be situated right on the breathtaking Newport Cliff Walk. It doesn't get any better than this for accommodations, weddings and fine dining. 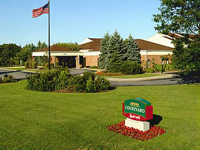 The Courtyard Marriott is the perfect hotel for business travelers and those wishing to be near the Newport Naval Base. It's located just minutes from downtown Newport, in neighboring Middletown. Enjoy the larger workspaces, high speed internet and indoor/outdoor pool. 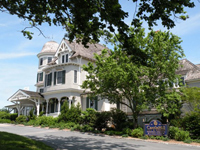 Located at One Bellevue Avenue, overlooking Newport's Historic Hill, Hotel Viking offers everything you desire. Luxurious suites, fine dining, spa, conference and wedding banquet facilities, just to name a few. Newport Rhode Island lodging at its finest. 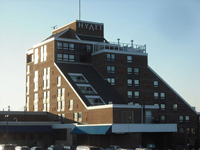 The Hyatt Regency Newport is another great location to stay while you're in the "City by the Sea". 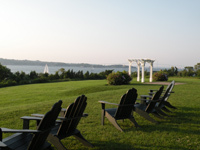 Located on Goat Island, you'll enjoy stunning views of Narragansett Bay, Newport Harbor and downtown Newport. Just a quick walk across the causeway and you'll be right in the middle of all the action. 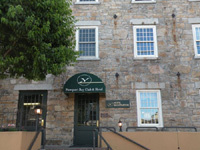 The Inn on Long Wharf is a nice place to stay, especially if you're traveling with children. Along with it's beautiful harbor views and proximity to the downtown attractions, this hotel has a great gameroom, pools and BBQ area. 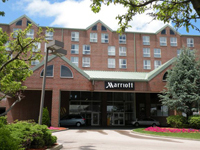 The Marriott is located in the middle of the action in downtown Newport. 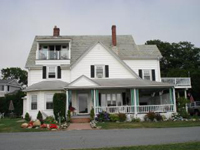 It has great views of Newport Harbor, and is right next door to the Newport Visitor's Center. You'll be within walking distance of most restaurants, shops and attractions. This former 19th century mill is now one of Newport's finest all-suite hotels, offering all the modern amenities you'd expect when you visit the historic "City by the Sea". 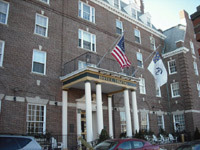 The Mill Street Inn is both a National Historic Landmark and a member of the Green Hotels Association. Few Newport Rhode Island hotels can compete with the location here. 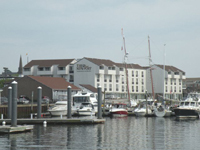 This hotel enjoys stunning views of Newport Harbor, Thames Street and America's Cup Avenue. It is just steps away from most of Newport's waterfront restaurants, unique shops and lively bar scene. If you're into sailing, shopping and waterfront restaurants, then it doesn't get any better than this. Dock here and enjoy stunning harbor views and live music while you dine at Pier 49 Restaurant. Just steps away from Newport's best attractions, nightlife and the waterfront. If you like cool ocean breezes and stunning panoramic views of Narragansett Bay and the Newport Bridge, then OceanCliff is the place for you! Situated on 10 acres of oceanfront along Newport's Ocean Drive. One of Newport's best wedding destinations.